This recipe for bison, beef & chorizo ground taco meat is absurdly simple. It is nothing more than ground meat, onions, bell peppers, portobello mushrooms, paprika, cumin, salt, pepper and lime zest. I decided to use bison and beef because I already had one pound bricks of each in my freezer. I wanted to add a third meat that had some fat and some flavor to it. Mexican chorizo is basically ground pork that is heavily seasoned. In this recipe, the chorizo is the foundation for flavor. Goodbye taco seasoning packets! Why mushrooms? Because mushrooms are packed with umami and are often used to mimic meat in vegetarian dishes. I also thought this would be a nice way to introduce portobello mushroom prep to the people that are reading this because it has the word 'meat' in the title. You can use green, red, yellow or orange bell peppers. The first time I made this dish I used yellow bell peppers because there were no greens ones in the grocery store. I did not think that was possible. I'm sure some of your are still at the point in your life where cooking or eating tacos at home means buying ground beef and a seasoning packet. Let's move past that. I like to serve this ultimate ground taco meat over rice with pickled red onions, avocado slices, lime juice, cilantro and cotija cheese. Your favorite fresh salsa or sautéed spinach would also be good options. If I am eating this as a taco, I like to do a layer of guacamole, then the meat, then the cotija, pickled red onions, cilantro and lime juice. If you have a friend that eats twice as much as a 'regular person' invite him or her over to pig out. Especially if that friend knows how to make a killer margarita. Slice the onion into half moons. If you aren't sure how to do that click here and follow steps 1 & 2. Rinse off and dry the bell peppers. Then cut into a medium dice. If this is your first time cutting a bell pepper click here and let Gordon Ramsay teach you the basics. After you cut the bell pepper into slices, rotate them 90 degrees and cut them into roughly 1/2" pieces. Wipe the dirt off of the mushrooms with a damp paper towel. Do not rinse the mushrooms. Break off the stems and discard (or save them for the next time you make a stock or broth). 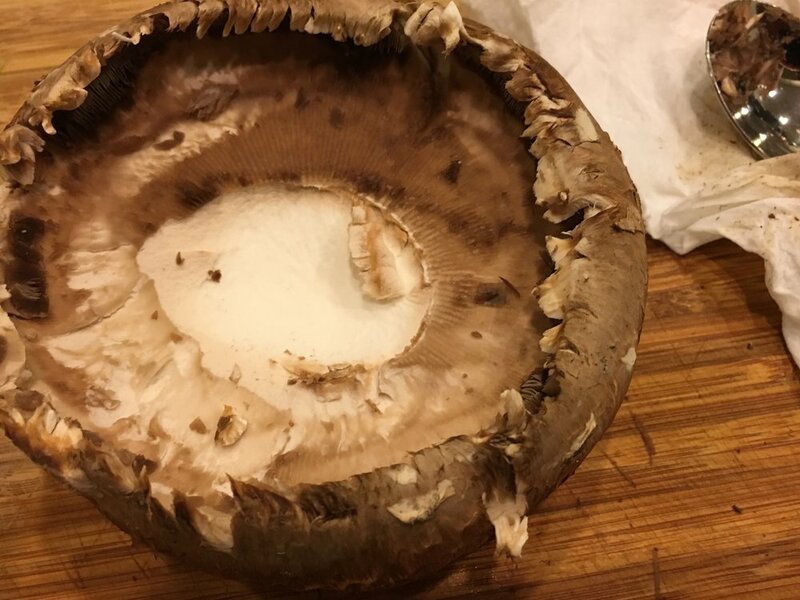 Use a spoon to scrape out the 'gills' from the underside of the mushroom. Cut the mushrooms into 1/4" slices. Rotate them 90 degrees and slice again. Heat up a large pot, pan or 5 quart dutch oven over medium heat. Add a splash of oil and then add the beef, bison and chorizo. After two minutes, use a wooden spoon to start breaking up the meat. Add 1/4 teaspoon of salt and some freshly ground black pepper. After five more minutes, break up the meat with the spoon again. Add 1 tablespoon of cumin, 1 tablespoon of paprika and stir. After the meat has cooked for 10 or 15 minutes it should no longer be pink when you break up larger pieces with the spoon. Line a large plate with paper towels and transfer the meat to the plate with a slotted spoon. Leave enough fat in your cooking vessel to coat the bottom of the pan. You can soak up the excess fat with paper towels or pour it off into a small glass bowl. The next day, once the fat has solidified, you can scrape it into your trash can. Increase heat to medium high and add the bell peppers, onion, mushrooms, 1/2 tablespoon of cumin, 1/2 tablespoon of paprika, a pinch of salt and freshly ground black pepper. Stir well to combine. Cover and cook for five minutes. After five minutes remove the lid. Cook uncovered for 10 more minutes. Stir well every 2 minutes or so. Add the meat and lower the heat to low. Stir well to combine and break up any remaining large chunks of meat with your spoon. Cover and reduce heat to low. Let cook for 5 more minutes. Use a microplane to zest the lime. Add the zest to the meat and stir well to combine.